What do we think will happen to the Mexican peso in 2019? The peso was one of the best performing currencies in 2018 despite enduring a volatile year, gaining to 18 against the dollar in April before weakening to 21 by mid-June. The volatility is very much a political story, both in the US and Mexico. As with the Canadian dollar, some strengthening of the MXN has occurred courtesy of the realisation that President Trump’s rhetoric on trade is a lot harsher than the reality of what can and has been negotiated. It seems correct that the disruption to the North American Free Trade Agreement (NAFTA) has likely come in 2018, although we must wait on a completion of its successor, the United States–Mexico–Canada Agreement (USMCA) before we can negate all risks on North American trade. Unfortunately for the peso, the weakness politically that we are likely to see in 2019 will be domestic. The election of Andrés Manuel López Obrador, known as AMLO, as President in 2018 was not taken well by Mexican markets and international investors given his opposition to Mexico’s largest infrastructure project, the renovation of Mexico City airport, and his decision to row back on education and energy reforms made under the previous administration. At the time of writing we are still waiting on AMLO’s first budget but increased spending given his left-wing populist credentials are all but priced in, the key thing will be how much the Mexican economy needs to grow to be able to make that additional spending viable – anything over 2.5% will be a stretch – and how supportive oil prices can be given the country’s reliance on the state-owned oil company PEMEX. 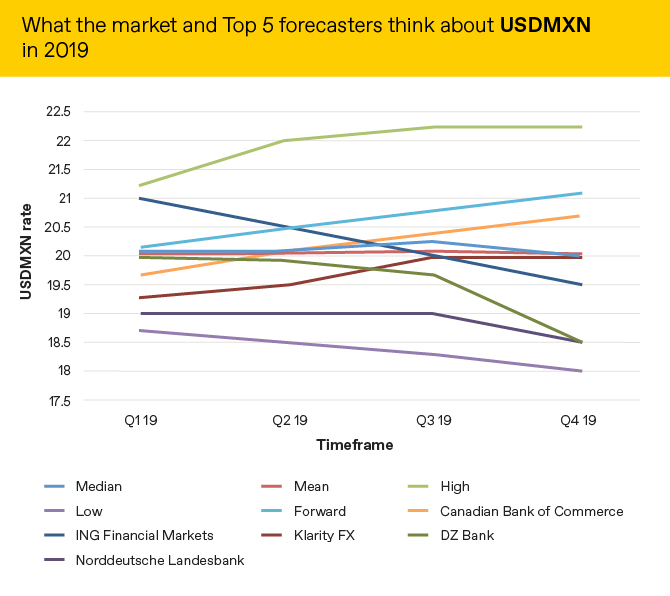 Market expectations of what will happen to the MXN versus the USD are below alongside the predictions of the 5 most accurate forecasters as measured by Bloomberg. What do we think will happen to the Indian rupee in 2019? What do we think will happen to the New Zealand dollar in 2019?